I inquired of the TTC whether the restriction at Distillery Loop was due to noise, and whether the CLRVs, when needed, could be operated on the 504B Dufferin service which does not go to the Distillery. Thanks to Brad Ross for the update. Effective with the October 7, 2018 schedules, the 514 Cherry car will disappear from the streets of Toronto. Since June 24 it has been on a temporary hiatus during the reconstruction of Broadview Avenue and a revised service on the 504 King car. On September 2, the “standard” service will resume on 504 King, 514 Cherry and 503 Kingston Road, but it will only last a month. The two services will operate at the same frequency and will be scheduled, to the degree anything like this actually happens on the TTC, so that they blend in the central part of the line rather than running in pairs. That will probably be greatest challenge given the TTC’s chronic inability to manage branching routes and the less than professional manner in which some operators run right behind their leaders rather than spacing out the service. Most of the recovery time (layovers) will be scheduled at Dufferin and Distillery Loops so that streetcars are not sitting in subway station loops with queues extending out onto the street. All service will be scheduled to operate with new Flexity low floor streetcars, although until the end of 2018, the TTC expects to be short a few cars and will substitute CLRVs (standard sized old streetcars). Some CLRVs will operate in the peak periods through the end of the year and will be designated on runs that operate outside the busiest hour in the morning and afternoon peak periods. These will be replaced by low-floor streetcars, as available, at the divisional level. This arrangement means that there could be random gaps in service to the Distillery depending on vehicle allocations of the day, and operators of these cars will lose their east end rest break. The effect of the new service design varies depending on the day of the week and the location on the route. AM peak service between Dundas West and Dufferin, and between Broadview Station and Sumach (the point where the Cherry line branches off) will change from a mixture of CLRVs and Flexitys every 3’40” to a Flexity every 5’15”. This is, just barely, a one for one replacement of capacity, but not on the peak part of the route. PM peak service on the outer ends will change from a CLRV/Flexity mixture every 4’15” to a Flexity every 6’00”. Midday and evening service on the outer ends of the line will also be less frequent, and it will be essential that all service actually reaches the terminals. Service in the middle part of the route from Dufferin to Sumach will generally be more frequent and will operate with all Flexitys once they are available. On weekends, the total number of cars in service goes up during all periods. The effect is that even though only half of the service is scheduled to run through to Dundas West and to Broadview Stations, the change in frequency is small. The central part of the line will see better service both in frequency and capacity. Overnight service on 304 King will continue to operate between Dundas West and Broadview Stations, but all runs will be scheduled with Flexitys. The PDF linked here shows the details of the changes. I will publish the full list of October service changes in a separate article. As a parting thought, it will be intriguing to see how many years it will take for the last of the signage, advertising and other TTC materials (notably the onboard route maps) to lose the 514 Cherry car. At least, only two months after the change, the cars are not all calling “Short Turn” at every stop. This article continues the analysis of the King Street Pilot with May 2018 data. Part I is in a separate article. Headway reliability on 504 King both in the downtown pilot area and at the terminals. Short turning on the 504 King car. Headway reliability on 514 Cherry and 503 Kingston Road. Headway behaviour for the consolidated 504, 514 and 503 services downtown. A detailed review of 504 King operation on certain days in May 2018. A common factor through this article is that while travel times in the pilot area have improved thanks to the transit priority scheme, the headways on all affected services are erratic, especially on 514 Cherry and 503 Kingston Road. Travel times through downtown are shorter and more reliable than during the pre-pilot period. Route capacity has improved partly from schedule changes and recapture of excess travel time, but mainly through the replacement of the older streetcars used on King with larger ones, primarily the new Flexity cars. Headway reliability (consistent times between cars) can be improved if random congestion events are reduced or eliminated, and reliable travel times lessen the need for short turns. No one change by itself “solves” King Street’s problems, and all three are needed to achieve benefits that will attract riders. An important part of a transit journey is the time spent waiting for a vehicle. One reason the subway is so popular, aside from its speed, is that trains come frequently and reasonably reliably, although this has become a sore point in recent years. Surface route reliability has always been an issue, and although trips may be faster, there is still the issue of how reliably vehicles actually show up to carry riders. The King Street Pilot project is well regarded for the improvement in travel times it brought to transit riders, and for the large jump in ridership on the route. In past articles, I have reviewed the statistics for travel times, but another important aspect is the reliability of headways – the intervals between streetcars. Early results showed a distinct improvement, but this has not been sustained. Moreover, headway reliability outside of the pilot area remains quite erratic, especially near the terminals. This brings us to the TTC’s assertion that if only the service would depart on time from the ends of its many routes, the problem of irregular service in the middle would look after itself. This is a completely bogus claim on two counts. First off, erratic service at terminals is the norm, and regularly spaced departures usually depend on hands-on service management by supervisors on the street. Second, service has a fair latitude to be considered “on time”, and even with this leeway, gaps and bunches quickly form that exceed TTC targets. In theory, if travel times are more consistent thanks to the pilot (or any other transit-supportive changes), then it should be easier to keep service properly spaced. Reality is somewhat different from theory. This article examines headway behaviour at Yonge Street for the 504 King car, as well as the combined service of the King and 514 Cherry cars. Although these are thought of as “blended” services, like all branching TTC routes, there is no co-ordination between the two routes and the Cherry cars fill gaps in the King service by accident, not by design. Beyond the limits of the Cherry cars (Sumach in the east, Dufferin in the west), the King service is as erratic after the pilot’s introduction as it was before. Also included is a review of 514 Cherry service on the outer ends of the route. Only recently has the service to Distillery and Dufferin Loops become more reliable and the improvement has more to do with revised schedules than with the King Street Pilot. Further to my report on a community meeting regarding early morning and late evening service on Cherry Street to Distillery Loop, the TTC has announced that full service will resume on Saturday, July 15. At a community meeting on June 27, 2017, the TTC presented updated information about their work on reducing the noise level from streetcars at King & Sumach. In response to complaints after the 514 Cherry route began operating in 2016, the TTC changed the 514 so that late evenings and early mornings it operates to Broadview & Queen (looping back via Dundas and Parliament just like a short turning 504 King car). During these periods, a Wheel Trans bus provided a shuttle service on Sumach and Cherry to Distillery Loop. 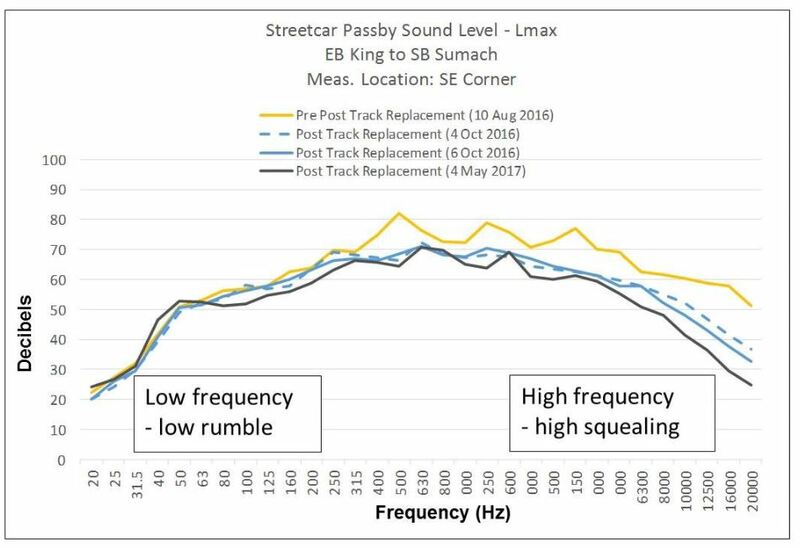 The TTC presented updated noise readings for this location showing the combined improvement of the full changeover to Flexity cars from CLRVs and of changes to the rail profile that were made to complement slower operation around the curves. 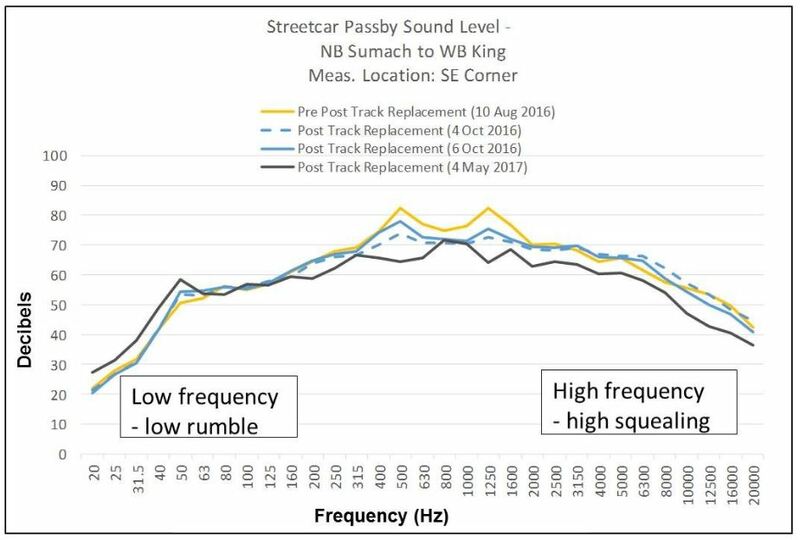 The chart above shows results for the tightest curve at King & Sumach, the east to south. The data plotted here summarize readings taken over a four-hour period, and so they reflect the contribution of whatever type of vehicles showed up. For the most recent reading on May 4, 2017, when the service should have been largely or completely run with Flexitys, the levels from the middle to the high end of the spectrum are markedly lower than they were in the fall. Depending on when the measurements were taken, there was at most one CLRV in service on the route, and none for most of the day. By contrast, on Aug. 10, 2016, all but one car on the route was a CLRV with only a single Flexity in service, 4418, between 5:30 am and 2:07 am the following day. For the north to west turn, the data show less of an improvement. Oddly, the readings for the gentler left turn curve are higher than for the eastbound right turn, but this could be a factor of the measurement location which is closer to the westbound turn. 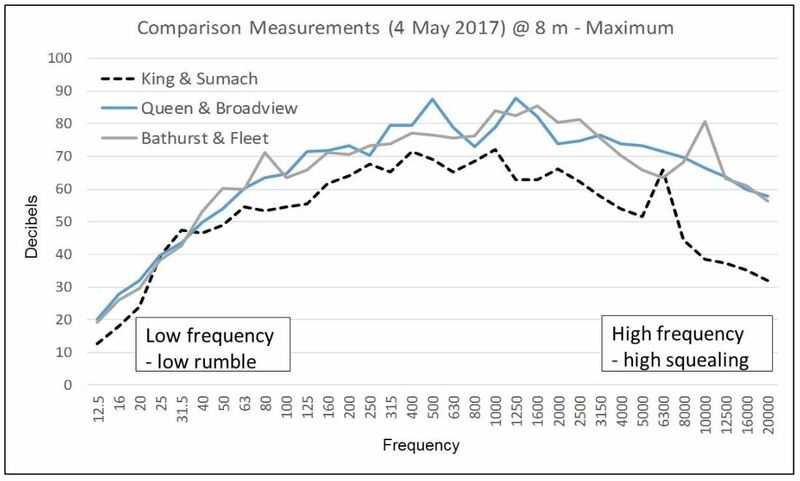 As a matter of comparison, the TTC also presented readings from two intersections with comparable curve radii, Queen & Broadview and Bathurst & Fleet. Note that this chart presents maximum values rather than a four hour average. The higher values for the comparator intersections are almost certainly due to the noise caused by CLRVs or ALRVs which have (a) inherently more squeal and (b) less car design factors to limit noise transmission. Bathurst & Fleet would have had service only on 509 Harbourfront on May 4 as this predates the return of streetcars to 511 Bathurst. I do not have the tracking data for the 509 on that date, and so cannot comment on the proportion of service provided by each vehicle type. Harbourfront is supposed to be all Flexity, but routinely has a few CLRVs on it. It would take only one noisy CLRV to set the maximum values shown above. The chart is also unclear about which turn was measured at each location, only that this was done from 8 metres away. Future work of this type should be more careful in identification of the vehicle type and location specifics for any readings and charts. If nothing else, this will improve credibility with members of the public by showing the improvements new cars bring. Based on the improvements recorded at King & Sumach, the TTC plans to return full streetcar service to Distillery Loop on a date to be announced in July. Squeal is worst after rain because the normal film of grease on the track (both from natural causes and from wheel greasers) washes away. Wet track actually is very quiet because the water acts as a lubricant, but track that is drying out can be extremely noisy. This also happens during periods of high humidity. The TTC was criticized for taking noise measurements only under ideal conditions. Residents at King/Sumach who predate the installation of the intersection were used to quieter streetcar operation, and enjoyed a long period of no streetcars at all while the King leg of the Don Bridge was closed. The Wheel Trans shuttle bus is utterly unreliable running on a schedule unknown to riders and with unpredictable headways that can be considerably longer than the round trip route would imply. Operators often bypass waiting passengers. There are safety issues for the large number of disabled transit users living in this neighbourhood if they are forced to make a transfer to an unreliable, infrequent service. Aggrieved King/Sumach residents proposed that the 514 Cherry route be completely converted to bus operation during the hours when the shuttle runs now to eliminate the transfer connection and improve service to the Distillery. This option was rejected by the TTC and by some users of the 514 who noted that streetcars can be very crowded at late evenings downtown where the route is supposed to provide supplementary service on King. Early morning trips from Leslie Barns to Distillery Loop make the west to south turn for which no automatic greasing is provided. Not all who attended from King/Sumach objected to the streetcars, but as this was a small meeting, it is not clear what the balance of opinion in the neighbourhood might be. Notable by its absence from any comments were complaints about noise from eastbound streetcars clattering through the trailing switch of the north to east curve. The slow order at this location appears to have dealt with this issue. In addition to operating the 514 Cherry route with only Flexitys, the TTC is working on a design of a noise absorbing ring that will damp the high frequency vibrations. Wheel sets for two cars are now being manufactured, and they will be installed on test cars in the fall. In a separate article, I will turn to the general unreliability of service at Distillery Loop on the 514 streetcars. The TTC puts this down to the usual problems of mixed traffic operation on King, but there are also issues with uneven headways departing from both the Distillery and Dufferin terminals following layovers that can be fairly long. Line management, as elsewhere on the system, is a problem for this service. See the TTC’s King-Sumach page for complete information. Since late 2016, the TTC has suspended streetcar service on Sumach and Cherry Streets south to Distillery Loop during late evenings and early mornings. The reason for this was that some residents near the junction at King & Sumach complained about noise and vibration from turning streetcars. In a related change, the TTC also imposed a 10km/h speed restriction on the intersection. During the periods when the 514 Cherry cars divert east to Broadview, a Wheel Trans shuttle bus operates over this route segment on a somewhat unpredictable schedule, and many would-be riders simply walk rather than wait for it. On Tuesday, June 27, 2017, there will be a public meeting to provide an update on the situation. I will update this post following the meeting. A related issue is the service reliability to Distillery Loop which can be very spotty at times. This will be the subject of a separate article coming soon. The 514 Cherry car has been running since June 2016. Although originally planned as a net new service, budget for the route fell victim to the 2016 round in which headroom for the “new” service was created by reallocating vehicles from 504 King. The purpose was to concentrate service on the central part of King where there is higher demand, but in practice, the original schedule did not work out. In November 2016 the headways on 514 Cherry were widened to compensate for longer-than-planned running times. The 514 Cherry car has been something of an afterthought for the TTC in several ways. Planning and construction for it began years ago, but implementation was delayed until after the Pan Am Games were out of the way and the Canary District began to populate with residents and students in the new buildings. Another major blow has been the failure to build the Waterfront East LRT which is intended to eventually connect with the trackage on Cherry Street as part of a larger network. In effect, the spur to Distillery Loop is treated by the TTC as little more than a place for a scheduled short turn of the King Street service, much as trackage on Dufferin Street south of King is for the route’s western terminus. Riders bound for the Distillery District face two challenges. One is that the older streetcars do not have route signs for 514 Cherry, only a small dashboard card wrapped over the “short turn” sign. Tourists might be forgiven for wondering if a 514 Cherry will ever show up. As new streetcars gradually appear on this route, this problem will decline, but it is an indication of the half-hearted way service was introduced that good signage was not part of the scheme. New low floor cars now operate on 514 Cherry, typically two in off-peak periods and four in the peak. However, the TTC appears to make no attempt to assign these cars to runs that are equally spaced on the route, and so it is common to see both of them near one of the other terminus with a wide gap facing anyone who actually needs to wait for one. Indeed, it is the same pair of runs that usually have a Flexity on them through much of December, and they do not provide evenly spaced accessible service over the route. The TTC is happy to crow about accessibility, but falls down in the execution. Worst of all are the actual headways found on 514 Cherry. Although the schedule was revised in November, and cars should generally have time to make their trips, it is very common to see two 514 Cherry cars close together followed by a long gap. This problem originates at the terminals, the points where the TTC’s target for “on time” service is no more than one minute early to five minutes late. This six minute window is routinely broken by service on the route, and the problem only gets worse as cars move across the city. In effect, the TTC has simply thrown out a bunch of extras for the King car and lets them run more or less at random providing supplementary capacity in the central part of the route.